This Friday, the 12th of September, we would like to invite you to an all-evening party funtime in Tårnsalen, KODE 4, during Kulturnatt! 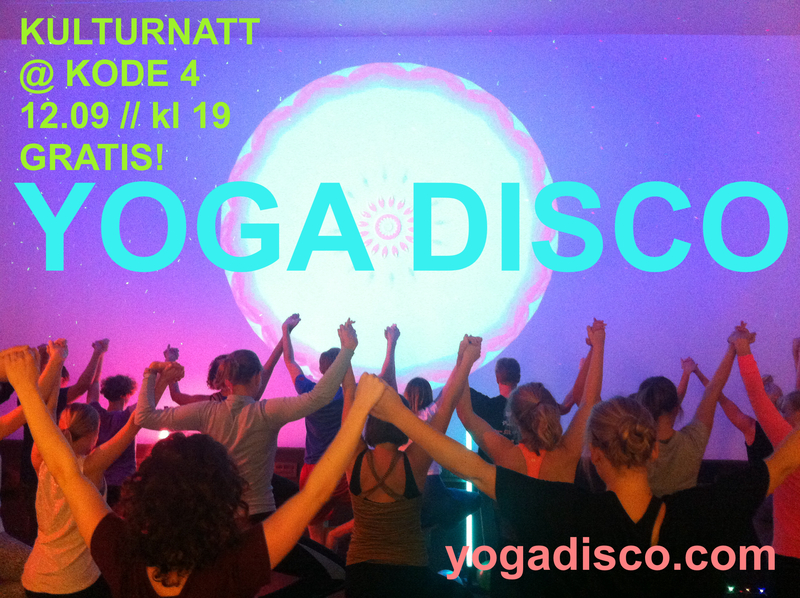 First we’ll have a Yoga Disco from 7 till 8:30pm, and then a special special SILENT Art Disco from 9 till 11pm! Both events are FREE and open to all, and there will be a little bar set up in Tårnsalen for refreshments during the silent disco. There’s no need to sign up in advance but it´s first come, first served according to space and the amount of (Silent Disco) headphones we have. Here’s a video from our last Silent Art Disco event in Margate for the opening of the Turner Contemporary Art Gallery 2011! Map is below, hope you´ll join us! Read more about the events at Kulturnatt in Bergen here. Just as a creative sequence might provide an opportunity to explore postures/ your body/state of mind in a new way, so does the element of sound. That´s where Nāda Yoga (the yoga of sound) enters the arena: It sees the primary stuff of the universe as vibrational and thus sonic. As music can affect our moods and minds in different ways, and using rhythmic varieties, melodies and varieties, combined with asana (yoga postures) and physical movement, think of this as an internal /external sonic exploration, if you will. Cosmic! A: Quite possibly. We use the term “disco” to connote a period of time where freedom was found in the music. Not just through the music but also what it represented. The opportunity to truly be who you are, no apologies, no shame, and no hiding. To get to the guts of your question, there will be many genres of music, tempos and “moods”. A: The volume is adjustable of course, but the sequence will also be demoed and i will be guiding you. But you are also free to experiment! If you´ve never been to a yoga class before, you might find placing yourself nearer to the back of the room is helpful, so you can see more of what´s going on. A: No problem. There are mats for you to borrow (but numbers are limited, so email dionneyoga@gmail.com to reserve asap). And wear something you can move in. Interpret that how you like, and fancy dress (sequins, lame, capes etc.) are welcomed and encouraged. We practice barefoot (but post-class feel free to bring on the platforms). This entry was posted in art + yoga, film, inspiration, lifestyle, music, news, playlists, schedule, Yoga Disco and tagged KODE Bergen, kulturnatt, kunst yoga, silent art disco, visit bergen, Visit Norway, yoga Bergen, Yoga Disco, yoga Norway. Bookmark the permalink. ← Yoga Recipe // Hey Moon!